If you want to ski untracked no competition powder without shelling out for a helicopter or sweating on touring skis, cat skiing could be just what you’re looking for! This guide will walk you through everything you should consider when planning your trip. Cat skiing might seem an odd name for an activity for true powder hounds, but these powerful caterpillar tracked vehicles are one of the most effective modes of mountain transport. Despite the moniker ‘poor man’s heliskiing,’ they have a number of unique advantages over helicopters in the pursuit of powder, and can be a golden ticket to some of the best descents of your life. 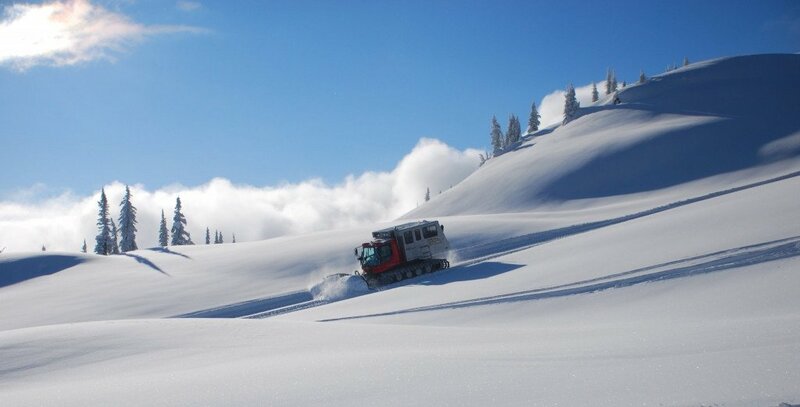 Unlike helicopters, snowcats don’t have down days: when the snow is falling too hard for the heli ops to fly and guests are stuck in the lodge all day, lucky cat skiers will be happy as pigs in the proverbial riding deep in the woods, gorging on faceshots and powdery pillows to their hearts content. Cat skiing is also more environmentally friendly than heliskiing, tends to be much more chilled out (it can take 15-20 minutes to ride back up to your next line rather than a 2-3 minute flight, so there’s plenty of time to blast some music and munch a few snacks), and is much cheaper – often half the price or less. British Columbia is the real home of cat skiing: it’s where it all began, and where you’ll find the majority of operators. Mountain Ranges like the Monashees, Selkirks and Kootenays are such perfect playgrounds that they might almost have been designed for cat skiing. The snow is consistently deep, but also dry and light; the trees are perfectly spaced with lots of natural features to play with, and the terrain is as steep or mellow as you want. However, you can go cat skiing around the world, from Japan to South America (in our summers). In particular there are some exciting new destinations in exotic countries like Macedonia, Russia and Georgia – as well as being more adventurous, they are often cheaper and have even less competition for fresh tracks. Cat skiing is generally associated with tree skiing, but most operators also have a good selection of alpine terrain too. 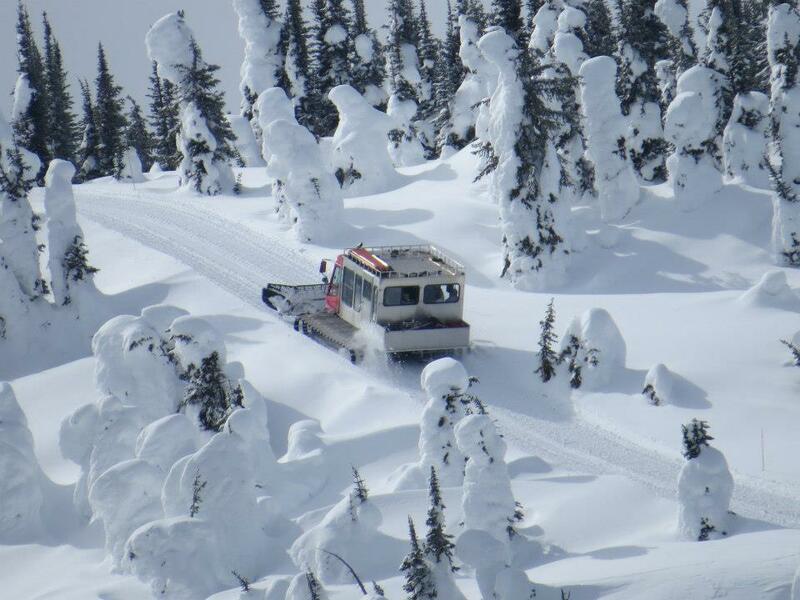 Unlike a helicopter snowcats need well maintained ‘roads’ or tracks to get around, so don’t expect to be able to simply point out a peak you like the look of. What’s up for grabs depends on the individual operator you choose, but all have an excellent range of terrain to choose from in different conditions – alpine when the sun shines, and trees when the snow falls. Generally you can find good conditions for cat skiing for most of the northern hemisphere winter, but the best time varies for each destination. February and early March is considered prime time for BC: the terrain has filled in, the snow is deep but still cold and dry, and there is plenty of day light. However, January is often great for storm skiing in the trees, while the more stable snow later in the season can be better if you hope to ride more alpine terrain. Japan is typically best from mid January to mid February, Siberia can be great from October onwards, Macedonia and Montenegro are best in mid-Winter, Georgia enjoys a long season with great snow well into Spring, and Alaska tends to be better from mid-March onwards when you have more daylight to play with. During the Southern Hemisphere winter, Chile is often at its best from mid-July through August. Many people assume heli and cat skiing are more ‘extreme’ than resort skiing, but this often isn’t the case. You need to be able to ski ungroomed and deep snow all day on moderate pitches (think red to black pistes) and comfortable skiing in the trees, but don’t expect charging 50° slopes and hucking huge cliffs all day! Most advanced intermediates should be able to enjoy cat skiing. 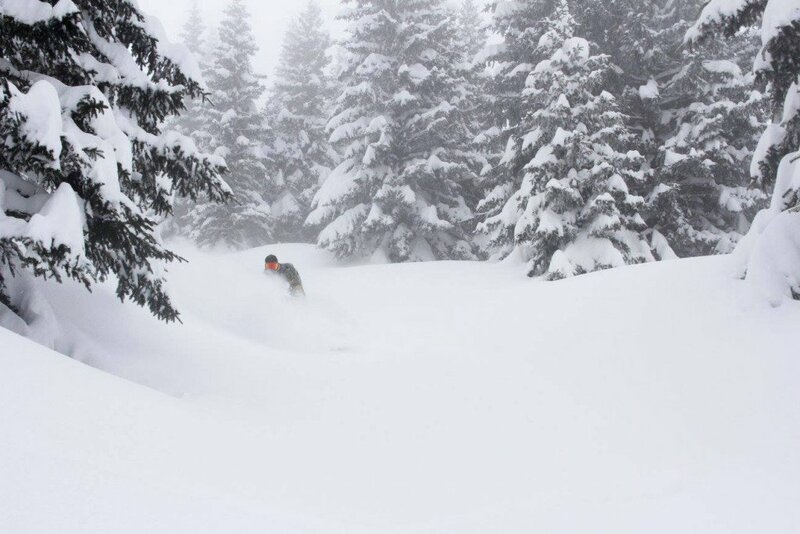 The snow is often much easier to ski than the sort of powder you find in resorts – it’s like hero snow: dry, light, untracked and forgiving. It feels like it cushions every move, and gives you a split second extra to correct any mistakes and find your balance again. Just don’t forget to bring fat powder skis, or you’ll be left behind! 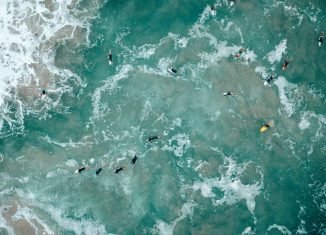 If you do want to ride genuinely challenging terrain, then you should try and bring enough people of the same level to fill a cat or make one who group. The guides will always try to find matching your abilities and aspirations as long as conditions are safe to do so, but it’s quite rare in open groups that everyone will be looking for high level terrain. 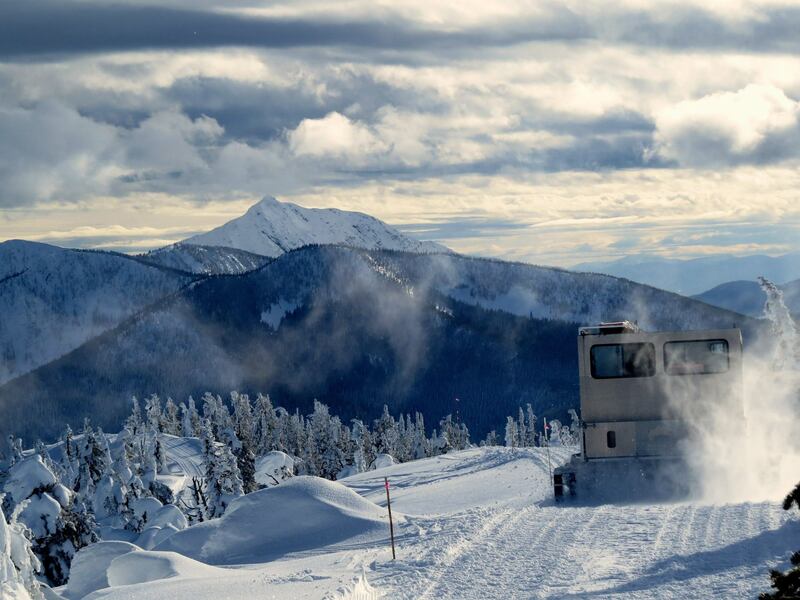 Most cat ski operators running multi day trips have the own accommodation or lodges, the standard of which runs the whole gamut from budget to total luxury. Some of the lodges are incredibly sumptuous, particularly in BC: after a long day in the hill, you can look forward to the full fine dining experience and high end spa facilities. After all, you need to make sure you recover fully before the next day’s powder pillaging! Alaska is sometimes a bit harder to reach than Canada. The flights between Anchorage and Valdez, for example, are frequently cancelled. Also, there are significant differences in travel time. Some packages seem very cheap at first, but end up costing a bomb when you add up the additional flight costs. One thing to bear in mind, particularly if you have time constraints, is how remote the lodge is and how long it will take you to travel there. Some are fairly straightforward to reach and relatively close to an airport, while others require a long drive or are helicopter access only. How much you ski depends on how fit and fast a skier you and your group are – you might get anywhere between 8 and 15 runs a day, of varying lengths and in all sorts of terrain. The different cat ski packages on offer are hugely varied, and it’s beyond the scope of this article to cover them all. If you and a group of hard charging mates want to travel together and ride challenging terrain all day then you may be better off booking one snowcat as a private group; conversely if you’re travelling alone and want a more relaxed vibe, an open group may be more suitable. It’s best to talk to an expert to work out what you really want from your trip, and which packages best suit that. In terms of cost, the more opulent BC lodges tend to be the most expensive, while Macedonia and Montenegro and more budget friendly. Great Northern are based in British Columbia’s renowned Selkirk Mountains. They offer all inclusive packages in luxury lodges for either 3 or 6 days, and with 34 years experience they have some of the most knowledgeable guides in the business. 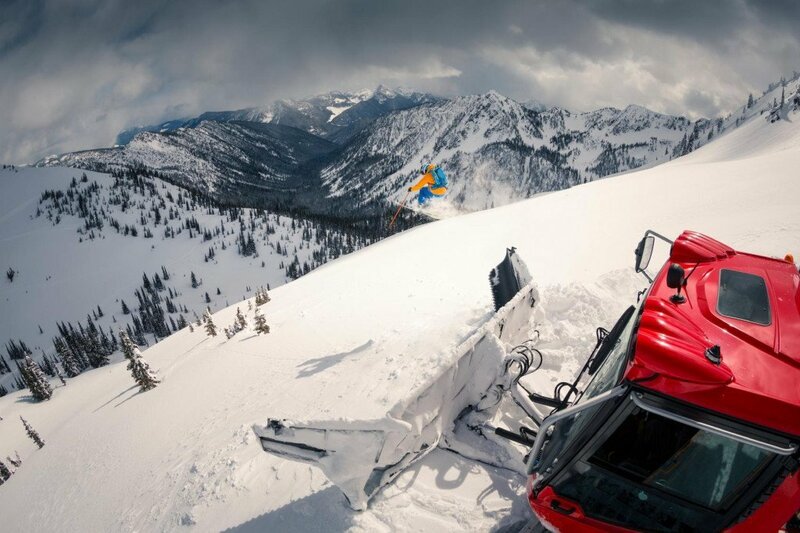 Eskimo Snowcat Freeride in FYRO Macedonia is the first snowcat operation in Europe. The whole trip is peppered by an exotic culture: FYRO Macedonia still has an air of mystery in it. Traditional and super stylish at the same time, it’s struggling to find its place in the postcommunist world. The location Popova Shapka, close to the black sea, delivers some pretty underrated snow storms, but the best thing is the sheer lack of people and competition for fresh tracks. Big Red Cats is the world’s largest cat skiing operation, and also one of the most unique: they are the only snowcat operation to offer separate trips for every level of skier or boarder, from intermediate to expert, advanced and even ‘uber expert.’ The terrain at Big Red Cats spans more than 19,000 acres, and includes 8 peaks, more than 400 runs, and some of the best glade and tree skiing in the world. Snowcat Freeride are bases in the beautiful little town of Kolasin, which sits between three mountain ranges with twenty peaks reaching over 2000m. From here you can set out on a new adventure each day in your own backcountry playground: the Dinaric Alps of Montenegro are host to vast and varied terrain, much of which is yet to be discovered.